Henry’s handwritten letter to Georgiana and a photo of Henry in the Netherlands later on the same trip. 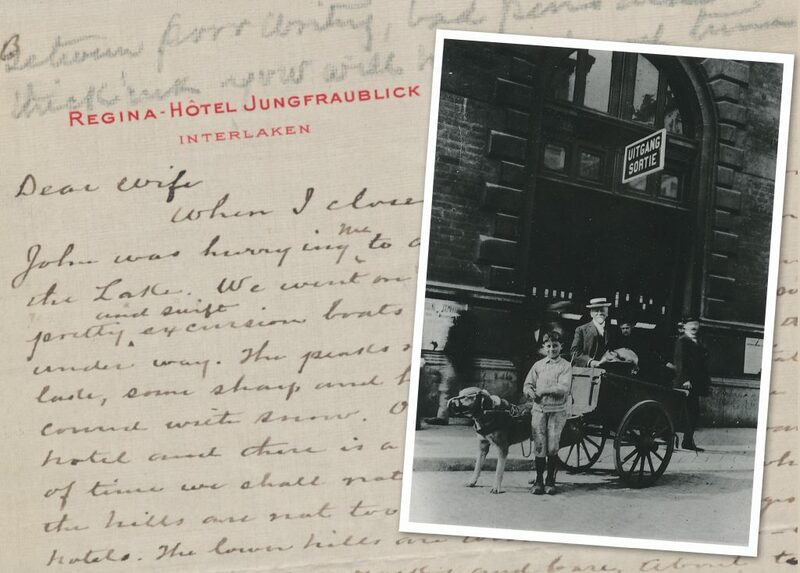 When I closed my letter at Lucerne John was hurrying me to a Sunday excursion on the Lake. We went on board one of the many pretty and swift excursion boats at 9 o’clock and were soon under way. The peaks rise up on every side of the lake, some sharp and high, and some partially covered with snow. On Rigi we could see a hotel and there is a railway to it, but for want of time we shall not go to it. Everywhere where the hills are not too steep there are cottages and hotels. The lower hills are wooded—mostly fir—while the mountains are rocky and bare. Almost two thirds the way we stopped for lunch, and then took carriage to see the roadway cut under arching rock and through tunnels. William Tell’s Chapel circa 1890-1900. Photo courtesy of Wikicommons. On the way passed William Tell’s Chapel and the scene of the well-known apple story and his troubles with Gessler. At Fluelen—the end of the Lake (28 miles) we again took the boat for the return trip. Immediately on our return we went to see the Lion of Lucerne. 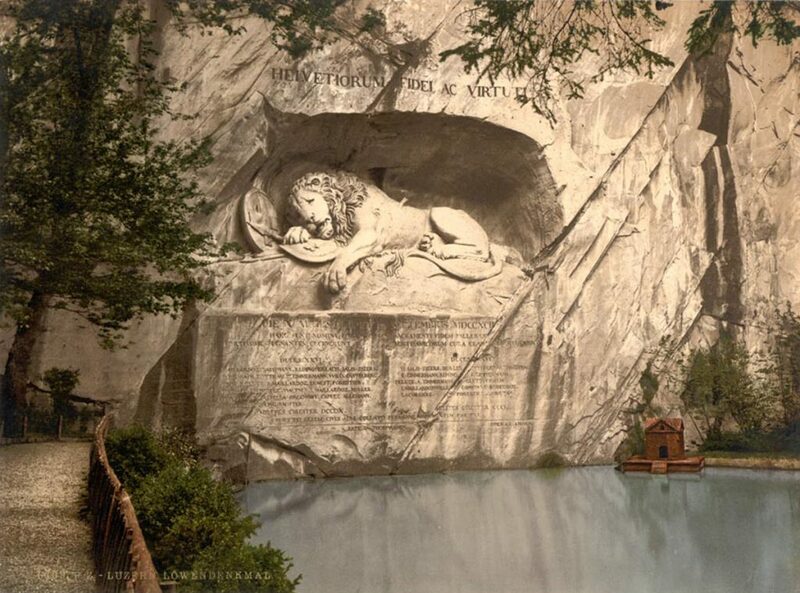 This is the life size figure of a lion carved in the face of a cliff in the center of the city to commemorate the overthrow of the Swiss Republic by Napoleon and represents a lion wounded to death defending the coat of arms—a shield bearing a square cross. It is a fine piece of carving. Below is a clear pond stocked with gold and other fish and a small park surrounds it. I forgot to mention that in coming down the lake we passed a natural stone column rising from the water eighty feet on which was a long inscription by Schiller to the memory of William Tell in gilt. The boat went by so fast I did not have time to read it. Lion Monument Lucerne Switzerland. Photo courtesy of Wikicommons. Sunday night it stormed hard, and our trip to the glacier which is the source of the Rhone was not a pleasant one on Monday. Showers fell every little while, and the mountains were hidden by the clouds. Our route was by train almost to the mouth of St Gotthard tunnel, which you know penetrates the Alps to Italy. We left it at Goeschan [sic Goschenen], but in that distance had made two loops entirely under ground in the solid rock. From Goschan [sic Goschenen] we took a carriage and at night stopped at one of the many wayside hotels called F___(?). Notwithstanding the showers and clouds it was surprising to see how many sight-seers were plodding along on foot—men, women and children—some in raincoats, some with umbrellas, and many without either, but all seemed to enjoy it. Early on Tuesday morning we came to the glacier—close to the road it is a fine one, but insignificant when compared with Muir. It was the first one John had ever seen, so we spent some time there. He went over it about a mile, while I picked edelweiss and flowers near the edge. In my light shoes I could not continue far on the ice. The clouds now cleared away and we had a pleasant drive down the glacial stream and over the next mountain. 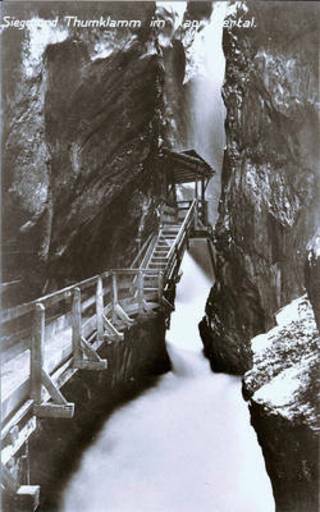 Historic photo of Sigmund-Thun-Gorge. Photo courtesy of Kaplun Museum. We lunched at Handeck Falls, where the river Aare makes a tremendous plunge into a narrow and deep gorge and seemed to disappear. Following down the rather pretty valley our driver stopped before a curiosity shop in a garden, on the door of which was a poster “Entree 1 fr.” We asked an explanation, and was [sic] told half in English and French, that our driver wanted us to go through a gorge while he drove over the mountain. Well, it was worth the frank [sic] for we walked for a mile through a fissure in the mountain sometimes twenty feet wide and sometimes less than half that, and except in some short tunnels we did not put our feet on ground. A board walk about three feet wide was built the whole and bolted into the stone walls and under this the river swept in a torrent. The walls must be 2000 feet high. At the sortie was a shop containing some of the finest wood carving I have ever seen. Two companion pieces—mountaineers—took my fancy and should have purchased if my purse was not so light. They were 500 francs. 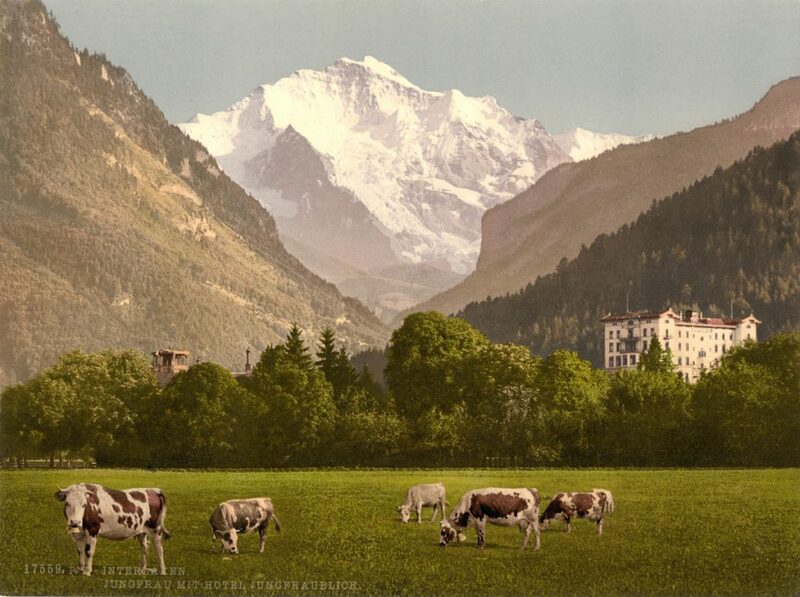 Jungfrau and Jungfraublick Hotel circa 1890-1900. Photo courtesy of Wikicommons. Our carriage having come we were soon at M___(?) where at 7pm. we took a train for Interlaken. 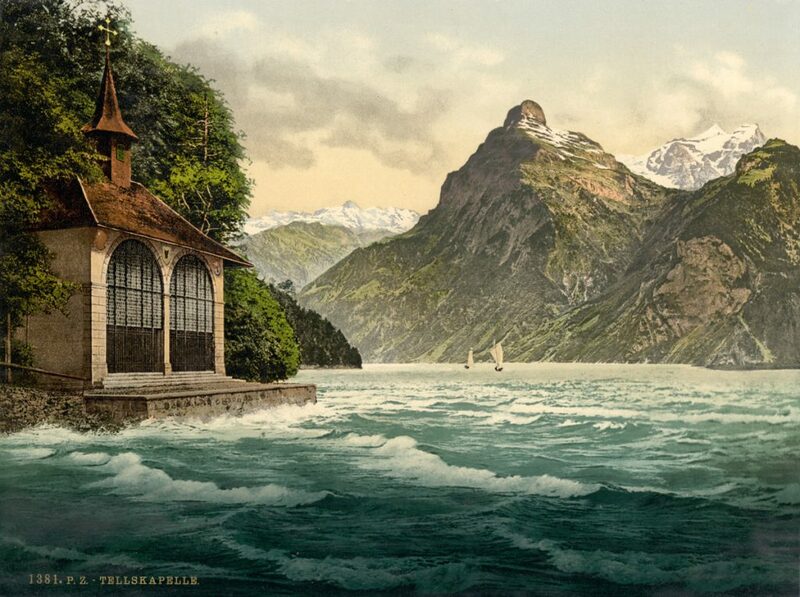 The train however did not take us far but transferred us to a boat on Brienz Lake. It was now dark, but we were told this lake was connected with Thun Lake by the river Aare, and at the end of this lake was the town of Interlaken (10 miles) where we stopped for the night at the Hotel Regina. This morning we took the train for Jungfrau and though the distance is not great (we could see the mountain from the hotel) it took us a long time to reach it, the cog wheel engines being so slow. We had been told we could go to the summit by train and elevator, but found the work not finished. The train took us up almost 11000 feet to Eismeer Station. A great distance is in a tunnel cut in solid rock, and at different places lateral tunnels are cut so that you can look out. At the last station a large room is cut out for an eating house. All is lighted by electricity. I have mailed you a printed description, so shall not say more now. To-morrow we go back to Lucerne, and at once take train for Cologne. Our aim is to go by Rotterdam and Amsterdam and take steamer for London to reach there by Sept 1st. It may be that John will be obligated to go to Brussels again but hopes not. I have requested Mr. Geernicks to forward my mail to Amsterdam, and hope to get papers covering dates giving particulars of Mr. Scotts [sic] death. I received at Lucerne all the dates to Aug 5.